Check on the details for each product to see which fasteners are included. Products for PVC/Vinyl fencing typically come with "TEK" screws. There is a choice of Finishes dependent on the product. Brushed, matte stainless steel finish or stainless steel with a black or white powder coat. Check which is available for each product. Grade 304 is the standard "18/8" stainless; it is the most versatile and most widely used stainless steel. 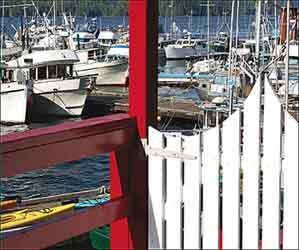 Grade 316 is "Marine" Grade and has the best anti-corrosion properties. It has excellent forming and welding characteristics. See Finishes for more. All stainless steels have excellent anti-corrosion characteristics and are used in high salt & humidity locations such as marine and coastal. Take Note: Pricing is for a Pair (PR) of Hinges or Each (EA) as noted. What Size Hinge do you need? Simple "L" and "T" shapes - "L" typically for wood, "T" for PVC. Rugged 10" Stainless Steel Handle finished with a Black Polyester Powder Coat. 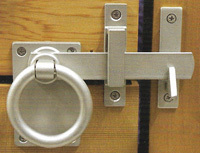 Stainless Steel fasteners for wood & PVC included. 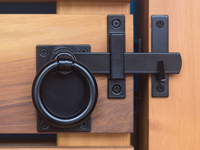 Use with HD Gravity Latches or Standard Latches for PVC. Stainless Steel fasteners for wood & PVC included. 10" Marine Grade Stainless Steel Handle. Perfect for door and gate pulls also for outdoor showers and saunas. 10" Marine Grade Stainless Steel Handle. 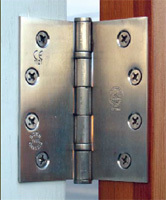 Perfect for door and gate pulls also for outdoor showers and saunas. Stainless Steel fasteners included. Rugged 10" Stainless Steel Handle finished with a Black Polyester Powder Coat. Made of Stainless steel and Aluminum alloy.